Bayern Munich manager Niko Kovac has all but cleared James Rodriguez to leave the club as both Arsenal and Liverpool are strongly linked with a transfer. 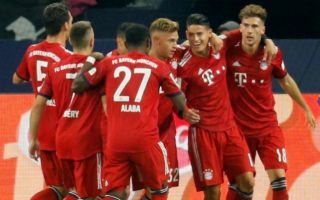 The Colombia international is currently into the second season of a two-year loan at Bayern from Real Madrid, but has struggled to impress in recent times for the Bavarian giants. While Rodriguez looked decent in his first season with the club after seeming to put his Real Madrid problems behind him, if you bet on soccer much you’ll likely be keeping an eye out on odds over his next move right now. All signs point towards the 27-year-old no longer having a future at the Allianz Arena, with plenty of recent reports suggesting he could be on his way to the Premier League – his preferred destination. The latest from Don Balon is that his manager Kovac has sent him a stern message regarding his work ethic and performances in training. The Croatian tactician is clearly not just going to give in and recall him to the starting XI easily, so Arsenal and Liverpool will now surely be on alert for the player, who has previously been said to be available for a transfer fee of roughly €70million from parent club Real Madrid, or even on another loan if his Bayern deal can be cancelled early. ‘James is playing his future, he has to have a great performance,’ Kovac said in a press conference. ‘We are a great club with great players, James is a great player who aspires to play, but those who do not call themselves James also want to play and are working harder. This doesn’t sound at all promising for Rodriguez, who could be a fine signing and play more often at either Arsenal or Liverpool. Don Balon also mention Napoli as potential suitors for the former Monaco man, who has been talked up as Unai Emery’s preferred target to replace the out-of-favour Mesut Ozil. At Liverpool, he could also do a decent job of helping the Reds replace Philippe Coutinho and challenge the likes of Sadio Mane and Roberto Firmino for their places in the team.